Eleven years ago, this essay argued against hate-crime laws. One argument read “People can eventually be accused of hate crimes when they use hateful speech. Hate crimes laws are a seed that can sprout in new directions.” This has now come to pass, I am sorry to say. This week, the Congress passed S. J. Res. 49, and President Trump signed it, making it part of the U.S. legal code. The law rejects “White nationalists, White supremacists, the Ku Klux Klan, neo-Nazis, and other hate groups…” But why? Because of their ideas? Because of their expression of these ideas? No government that stands for freedom and free speech, whose charge is to protect rights, should be singling out specific groups by name and by law declaring them as outlaws or threats because of their philosophies. If they have committed a crime, such as defamation of character or incitement to riot or riot itself, then charge them and try them. But American government has no legitimate authority to single out some of its citizens in this way. This, furthermore, is an exceedingly bad precedent. Who’s next? This law regards free speech as a threat, linking it to violence, painting them with one brush. There can be no justice that can stem from such a completely sloppy and inexcusably amateurish legal treatment. This linkage is made clear in paragraph seven with this language: “…communities everywhere are concerned about the growing and open display of hate and violence being perpetrated by those groups…” There is no distinction made here between the “open display of hate” and “violence being perpetrated”. As I predicted 11 years ago in arguing against hate crime laws, hate speech is being identified with hate crime. I am just as uncomfortable with the notion of defining and singling out “hate speech” as some sort of new danger or threat or harmful activity or crime, to be dealt with by government or courts of law as I was 11 years ago with the idea of “hate crime”. The standard categories of crime are quite enough without adding to them a government laundry list of prejudices and aversions that everyone is not supposed to express or feel, under penalty of government law. Reprinted with permission from LewRockwell.com. Dear Arthur: The world owes you an Apology and a great big Thank-You. First the Apology. For ten years of harassment, invasion and intrusion, and a giant legal battle. All for telling the truth. In a world where truth and lies are inverted, in a world where everything is turned upside-down, your truth-telling has been deemed a crime. Now the Thank You. Your principled and valiant truth-telling , unwavering in the face of huge obstacles, has been momentous! You have enlightened and inspired untold many of us. The ripple effect of your work will grow into a tsunami of Light and Truth. Arthur Topham of Quesnel B.C. has been sentenced to silence for now, after a 10 year legal battle. His crime is that he fearlessly wrote about the state of the world in his online website RadicalPress.com, and that was just too much for the Zionist Powers to bear. Those who feel threatened by a peaceful man expressing his views online are obviously very nervous and afraid. If there was nothing to hide and if these online publishings were so erroneous as they would like us to believe, this group would not feel threatened. Arthur Topham would simply be ignored. The reaction alone should be enough to trigger people to question: what is it that is so taboo to say? Trying to stop the truth from coming out is as futile as if you were trying to drink the lake dry to prevent drowning in it. Even the modern-day book burnings cannot succeed in vaporizing the truth. The truth is emerging at an exponential rate, and these desparate attempts by the Powers-That-Be to silence truth-tellers are a show of their panic. Harry Abrams and Richard Warman are the two men who initiated the legal assault against Arthur Topham. Those are their names. Arthur was not allowed to ever mention their names during those years of legal battle because somehow they feared it might bring danger to their lives. Now what about the danger they posed to Arthur, endlessly defaming him?! 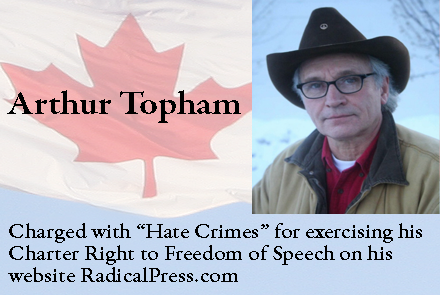 In a trial by jury in October-November 2015, Arthur Topham was found guilty on one count and not guilty on another count of exactly the same charge, namely, by communicating statements, other than in private conversation, willfully promoting hatred against an identifiable group, people of the Jewish religion or ethnic origin, contrary to section 319(2) of Criminal Code of Canada. The identical two charges were for different time periods. In the Canadian court of law, the burden of proof switches to the defense to affirm that there was no ‘hate’ under CCC section 319(2). The prosecution need not produce victims of the alleged hatred. What is ‘hate’ but an emotion? How does anybody know what is in someone else’s head? One of the defenses is 319(2)(c) if the statements were relevant to any subject of public interest, the discussion of which was for the public benefit, and if on reasonable grounds he believed them to be true. Again, how can anyone prove that Arthur Topham did not believe what he was writing? Are they mind-readers? For an interesting commentary of the extraordinary trial and background, please see this article by Eve Mykytin. She is an American lawyer who attended the second week of the trial. She covers, for example, the story of Len Rudner who was established as an expert witness for the Crown. His written expert opinion was identical to the written expert opinion submitted by Bernie Farber who was originally supposed to be the Crown’s expert witness. (Farber pulled out of his commitment when he learned that he would not be permitted to appear via video-link.) Yet Len Rudner told the court that he himself was the author of his “expert opinion”. Rudner also had tried to have Arthur Topham’s website shut down before the trial. Conflict of interest, is it not? Still, he was permitted to be an expert witness. Very strange, to say the least. It can be fairly assumed that Arthur Topham’s parody on the infamous book Germany Must Perish was the item which caused the jury to give a guilty verdict, as the publishing of that parody fell within the “guilty” time period. Germany Must Perish was written in 1941 by an American Jew named Theodore Kaufman, and it was generally praised and promoted at that time by the mainstream media (MSM). The sheer monstrosity of the book is breathtaking, and even more shocking is the fact that it was not condemned when it appeared in 1941. Theodore Kaufman concocted a sick plan to annihilate the German people, the stated goal being that Germany must perish. The plan was to hire thousands of surgeons to sterilize all German men of reproductive age, and voilà, no more Germans. Gone Forever. The hateful book was subsequently almost forgotten, until Arthur Topham found a provocative way to bring attention to the hideousness of that genocidal text. He reproduced portions of the book word for word, except that he replaced “Germany” with “Israel” and “Germans” with “Jews”. Germany Must Perish became Israel Must Perish, and so on. The two texts, original and parody, appeared side by side on his website. In a trick of Orwellian Doublespeak, B’nai Brith Canada now tells the world that Arthur Topham called for Jews to be forcibly sterilized. No context, nothing. It is crazy making! It is just another glaring example of how B’nai Brith and the MSM engage in deliberate deception to turn reality 100% on its head. Unless someone has been following the case very closely, the uninformed general public has no reason to doubt the story they are told about how Arthur Topham called for sterilization of the Jews. People cannot even check for themselves, because the website has been taken down, as part of sentencing. In these times of universal deceipt, the messenger who seeks to warn us about the villain, is himself labelled the villain. Perhaps the members of the jury did not understand the meaning of satire or parody. Or perhaps the convoluted court proceedings or the instructions given by the judge curtailed their ability to perceive it this way. The jury members are also not immune to the mind-contaminating effects of all the toxic lies and atrocity propaganda we have been subjected to since birth. We have been programmed to respond in specific ways to certain words, these words being the number one weapon in the psychological warfare being conducted on us without most of us realizing it. He does not call for violence; his views were political satire. It is not his intent to indirectly incite violence. ~ the judge said during the sentencing proceedings. By these words, does the judge basically exonerate Arthur Topham? Methinks so. I felt that I had a duty as a Canadian citizen to alert the general public of an imminent threat… the interests of the Jewish lobby. He also expressed gratitude that his concerns had been brought to the record. the timing is especially disturbing, as Canada’s Jewish community reels from a series of bomb threats against our community centers, inspired by the same hateful ideology that drives Mr. Topham. [He] is a committed and unrepentant Jew-hater, who persisted in publishing lurid anti-Semitic content on his website throughout this legal process. Canada’s laissez-faire approach to hate crimes continues to fail minority groups and puts them at increased risk of attacks against their lives or property. This is interesting in light of the news that an American-Israeli Jewish teen has just been arrested in connection with a series of bomb threats against Jewish institutions on several continents. Good timing Mr. Mostyn, very disturbing indeed. Canada’s Hate Speech Laws – Who Do They Serve? Well said Arthur! 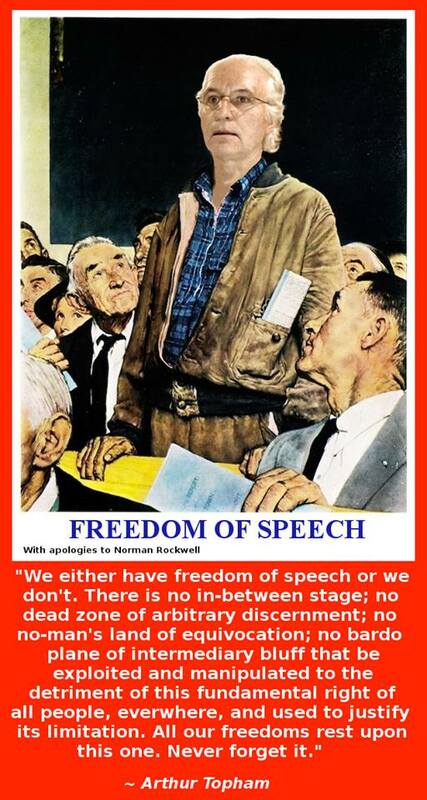 If some things are not permitted to be said, then we do not have freedom of speech. Period. I have heard seemingly intelligent people repeat the mantra which has been programmed into their heads “but hate speech is not the same as free speech”! I say to them, who determines what “hate” speech is? Who controls the Mass Media? Who controls Hollywood? Who controls our law-makers? Truth is Hate to those who Hate the Truth. THANK YOU ARTHUR TOPHAM for your service to humanity! Enjoy the imposed quiet time. The torch is being passed forward. There are countless torch carriers. Geert Wilders, the leader of the Dutch Freedom Party in the Netherlands which is now number one in the polls, gives a courageous speech to Members of the Court in the Netherlands where he has been accused of discrimination and inciting racism for remarks in 2014, televised live, in which he led a roomful of followers in chanting that they wanted “fewer” Moroccans in the Netherlands. And he is absolutely correct that the Criminals Justice (sic) System is becoming a farce and will suffer a fate similar to the Lying Main Stream Media which is populated increasingly by journalistic whores. When true justice diverges from natural law, truth and morality, then the justice system has lost its legitimacy and we are on the road to tyranny. The European Union’s White-hating elite,with Polish part Jewish Angela Merkel leading the pack, seeks to replace the indigenous people of Europe with a malleable Third World mish-mash. This was the evil goal of the EU’s mastermind Count Richard Coudenhove-Kalergi, who dreamed of a Europe without nationalities, a new mixed-raced European man, part African, part Asian, with a new moral aristocracy of Jews. This nightmare blueprint for genocide has never been honestly presented to Europeans. When I decided to address you here today, by making a final statement in this trial against freedom of speech, many people reacted by telling me it is useless. That you, the court, have already written the sentencing verdict a while ago. That everything indicates that you have already convicted me. And perhaps that is true. Nevertheless, here I am. Because I never give up. And I have a message for you and The Netherlands. For centuries, the Netherlands are a symbol of freedom. Who one says Netherlands , one says freedom. And that is also true, perhaps especially, for those who have a different opinion than the establishment, the opposition. And our most important freedom is freedom of speech. We, Dutch, say whatever is close to our hearts. And that is precisely what makes our country great. Freedom of speech is our pride. And that, precisely that, is at stake here, today. I refuse to believe that we are simply giving this freedom up. Because we are Dutch. That is why we never mince our words. And I, too, will never do that. And I am proud of that. No-one will be able to silence me. Moreover, members of the court, for me personally, freedom of speech is the only freedom I still have. Every day, I am reminded of that. This morning, for example. I woke up in a safe house. I got into an armored car and was driven in a convoy to this high security courtroom at Schiphol. The bodyguards, the blue flashing lights, the sirens. Every day again. It is hell. But I am also intensely grateful for it. Because they protect me, they literally keep me alive, they guarantee the last bit of freedom left to me: my freedom of speech. The freedom to go somewhere and speak about my ideals, my ideas to make The Netherlands – our country – stronger and safer. After twelve years without freedom, after having lived for safety reasons, together with my wife, in barracks, prisons and safe houses, I know what lack of freedom means. I sincerely hope that this will never happen to you, members of the court. That, unlike me, you will never have to be protected because Islamic terror organizations, such as Al-Qaeda, the Taliban and ISIS , and who knows how many individual Muslims want to murder you. That you will no longer be allowed to empty your own mailbox, need to carry a bulletproof vest at meetings, and that there are police officers guarding the door whenever you use the bathroom. I hope you will be spared this. However, if you would have experienced it – no matter how much you disagree with my views – you might perhaps understand that I cannot remain silent. That I should not remain silent. That I must speak. Not just for myself, but for The Netherlands, our country. That I need to use the only freedom that I still have to protect our country. Against Islam and against terrorism. Against immigration from Islamic countries. Against the huge problem with Moroccans in The Netherlands . I cannot remain silent about it; I have to speak out. That is my duty, I have to address it, I must warn for it, I have to propose solutions for it. I had to give up my freedom to do this and I will continue. Always. People who want to stop me will have to murder me first. And so, I stand here before you. Alone. But I am not alone. My voice is the voice of many. In 2012, nearly 1 million Dutch have voted for me. And there will be many more on March 15th. According to the latest poll, soon, we are going to have two million voters. Members of the court, you know these people. You meet them every day. As many as one in five Dutch citizens would vote Party for Freedom, today. Perhaps your own driver, your gardener, your doctor or your domestic aid, the girlfriend of a registrar, your physiotherapist, the nurse at the nursing home of your parents, or the baker in your neighborhood. They are ordinary people, ordinary Dutch. The people I am so proud of. They have elected me to speak on their behalf. I am their spokesman. I am their representative. I say what they think. I speak on their behalf. And I do so determinedly and passionately. Every day again, including here, today. So, do not forget that, when you judge me, you are not just passing judgment on a single man, but on millions of men and women in The Netherlands. You are judging millions of people. People who agree with me. People who will not understand a conviction. People who want their country back, who are sick and tired of not being listened to, who cherish freedom of expression. Members of the court, you are passing judgment on the future of The Netherlands . And I tell you: if you convict me, you will convict half of The Netherlands . And many Dutch will lose their last bit of trust in the rule of law. Of course, I should not have been subjected to this absurd trial. Because this is a political trial. It is a political trial because political issues have to be debated in Parliament and not here. It is a political trial because other politicians from – mostly government parties – who spoke about Moroccans have not been prosecuted. It is a political trial because the court is being abused to settle a political score with an opposition leader whom one cannot defeat in Parliament. This trial here, Mr. President, it stinks. It would be appropriate in Turkey or Iran , where they also drag the opposition to court. It is a charade, an embarrassment for The Netherlands, a mockery of our rule of law. And it is also an unfair trial because, earlier, one of you – Mrs. van Rens – has commented negatively on the policy of my party and the successful challenge in the previous Wilders trial. Now, she is going to judge me. What have I actually done to deserve this travesty? I have spoken about fewer Moroccans on a market and I have asked questions to PVV members during a campaign event. And I did so, members of the court, because we have a huge problem with Moroccans in this country. And almost no-one dares to speak about it or take tough measures. My party alone has been speaking about this problem for years. Just look at these past weeks: Stealing and robbing Moroccan fortune seekers in Groningen , abusing our asylum system, and Moroccan youths terrorizing entire neighborhoods in Maassluis, Ede and Almere. I can give tens of thousands other examples, almost everyone in The Netherlands knows them or has personally experienced nuisance from criminal Moroccans. If you do not know them, you are living in an ivory tower. I tell you: If we can no longer honestly address problems in The Netherlands, if we are no longer allowed to use the word alien, if we, Dutch, are suddenly racists because we want Black Pete to remain black, if we only go unpunished if we want more Moroccans or else are dragged before the penal court, if we sell out our hard-won freedom of expression, if we use the court to silence an opposition politician, who threatens to become Prime Minister, then this beautiful country will be doomed. That is unacceptable, because we are Dutch and this is our country. And again, what on earth have I done wrong? How can the fact be justified that I have to stand here as a suspect, as if I robbed a bank or committed murder? I only spoke about Moroccans on a market and asked a question on an election night meeting. And anyone, who has the slightest understanding of politics, knows that the election night meetings of every party consist of political speeches full of slogans, one-liners and making maximum use of the rules of rhetoric. That is our job. That is the way it works in politics. Election nights are election nights with rhetoric and political speeches; not university lectures, in which every paragraph is scrutinized 15 minutes long from six points of view. It is simply crazy that the Public Prosecutor now uses this against me, as if one would blame a football player for scoring a hattrick. Indeed, I have said on the market in the beautiful Hague district of Loosduinen “if possible fewer Moroccans.” Mark that I did so a few minutes after a Moroccan lady came to me and told me she was going to vote PVV because she was sick and tired of the nuisance caused by Moroccan youths. And on election night, I began by asking the PVV audience “Do you want more or fewer EU,” and I did also not explained in detail why the answer might be fewer. Namely, because we need to regain our sovereignty and reassert control over our own money, our own laws and our own borders. I did not do that. Then, I asked the public “Do you want more or fewer Labour Party.” And, again, I did not explain in detail why the answer might be fewer. Namely, because they are the biggest cultural relativists, willfully blind and Islam hugging cowards in Parliament. I did not say that. And, then, I asked “Do you want more or fewer Moroccans” and, again, I did not explain in detail why the answer might be fewer. Namely, because people with a Moroccan nationality are overrepresented in the Netherlands in crime, benefit dependency and terror. And that we want to achieve this by expelling criminals with also the Moroccan nationality after denaturalizing them of their Dutch nationality and by a stricter immigration policy and an active voluntary repatriation policy. Proposals which we have made in our election manifesto from the day I founded the Party for Liberty . I explained this in several interviews on national television, both between the statement on the market and election night, as well as on election night a few moments after I had asked the said questions. It is extremely malicious and false of the Public Prosecutor to want to disregard that context. Disgusting – I have no other words for it – are the actions of other politicians, including the man who for a few months may still call himself Prime Minister. Their, and especially his, actions after the said election night constituted a real persecution, a witch hunt. The government created an atmosphere in which it had to come to trial. Prime Minister Rutte even told small children during the youth news that I wanted to expel them and then reassured them that this would not happen. As if I had said anything of that kind. It is almost impossible to behave viler and falser. But, also, the then Minister of Security and Justice, who, it should be noted, is the political boss of the Public Prosecutor, called my words disgusting and even demanded, he demanded that I take them back. A demand of the Minister of Justice, you do not have to be called Einstein to predict what will happen next, what the Public Prosecutor will do, if you do not comply to the demand of the Minister of Justice. The Interior Minister and the Deputy Prime Minister, too, both from the Labour Party, expressed themselves similarly. In short, the government left the Public Prosecutor no option than to prosecute me. Hence, in this trial, the Officers of Justice are not representatives of an independent Public Prosecutor, but accomplices of this government. Mr. President, the elite also facilitated the complaints against me. With preprinted declaration forms. Which were brought to the mosque by the police. In which, it has to remarked, the police sometimes said that they, too, were of the opinion that my statements were inadmissible. And a sample made by us showed that some complaints were the result of pure deception, intimidation and influence. People thought they were going to vote, they not even know my name, did not realize what they were signing or declared that they did not feel to be discriminated against by me at all. Someone said that, at the As Soenah mosque after Friday prayers alone, 1,200 complaints had been lodged because it was thought to be an election. There were parades, led by mayors and aldermen, like in Nijmegen , where CDA mayor Bruls was finally able to show off his deep-seated hatred of the PVV. The police had extra opening hours, offered coffee and tea, there were dancing and singing Moroccans accompanied by a real oompah band in front of a police station, they turned it into a big party. But meanwhile, two representative polls, one commissioned by the PVV, the other commissioned by De Volkskrant, showed that, apart from the government and media elite, 43% of the Dutch people, around 7 million people, agree with me. Want fewer Moroccans. You will be very busy if the Public Prosecutor is going to prosecute all these 7 million people. Like Labour leader Samsom, who said that Moroccan youths have a monopoly on ethnic nuisance. Or Labour chairman Spekman, who said Moroccans should be humiliated. Or Labour alderman Oudkerk ,who spoke about f*cking Moroccans. Or Prime Minister Rutte, who said that Turks should get lost. And what about police chief Joop van Riessen, who said about me on television – I quote literally: “Basically one would feel inclined to say: let’s kill him, just get rid of him now and he will never surface again”? And in reference to PVV voters, van Riessen declared: “Those people must be deported, they no longer belong here.” End of quote. The police chief said that killing Wilders was a normal reaction. That is hatred, Mr. President, pure hatred, and not by us but against us. And the Public Prosecutor did not prosecute Mr. Van Riessen. But the Public Prosecutor does prosecute me. And demands a conviction based on nonsensical arguments about race and on concepts that are not even in the law. It accuses and suspects me of insulting a group and inciting hatred and discrimination on grounds of race. How much crazier can it become? Race. What race? I spoke and asked a question about Moroccans. Moroccans are not a race. Who makes this up? No-one at home understands that Moroccans have suddenly become a race. This is utter nonsense. Not a single nationality is a race. Belgians are no race, Americans are no race. Stop this nonsense, I say to the Public Prosecutor. I am not a racist and my voters are neither. How do you dare suggest that? Wrongly slandering millions of people as racists. 43% of the Dutch want fewer Moroccans, as I already said. They are no racists. Stop insulting these people. Every day, they experience the huge problem with Moroccans in our country. They have a right to a politician who is not afraid to mention the problem with Moroccans. But neither they nor I care whether someone is black, yellow, red, green or violet. I tell you: If you convict someone for racism while he has nothing against races, then you undermine the rule of law, then it is bankrupt. No-one in this country will understand that. And now the Public Prosecutor also uses the vague concept ‘intolerance’. Yet another stupidity. The subjective word intolerance, however, is not even mentioned in the law. And what for heaven’s sake is intolerance? Are you going to decide that, members of the court? It is not up to you to decide. Nor to the Supreme Court or even the European Court . The law itself must determine what is punishable. We, representatives, are elected by the people to determine clearly and visibly in the law for everyone what is punishable and what is not. That is not up to the court. You should not do that, and certainly not on the basis of such subjective concepts which are understood differently by everyone and can easily be abused by the elite to ban unwelcome opinions of the opposition. Do not start this, I tell you. Our ancestors fought for freedom and democracy. They suffered, many gave their lives. We owe our freedoms and the rule of law to these heroes. But the most important freedom, the cornerstone of our democracy, is freedom of speech. The freedom to think what you want and to say what you think. If we lose that freedom, we lose everything. Then, The Netherlands cease to exist, then the efforts of all those who suffered and fought for us are useless. From the freedom fighters for our independence in the Golden Age to the resistance heroes in World War II. I ask you: Stand in their tradition. Stand for freedom of expression. By asking a conviction, the Public Prosecutor, as an accomplice of the established order, as a puppet of the government, asks to silence an opposition politician. And, hence, silence millions of Dutch. I tell you: The problems with Moroccans will not be solved this way, but will only increase. For people will sooner be silent and say less because they are afraid of being called racist, because they are afraid of being sentenced. If I am convicted, then everyone who says anything about Moroccans will fear to be called a racist. Mr. President, Members of the Court, I conclude. A worldwide movement is emerging that puts an end to the politically correct doctrines of the elites and the media which are subordinate to them. That has been proven by Brexit. That has been proven by the US elections. That is about to be proven in Austria and Italy . That will be proven next year in France , Germany , and The Netherlands. The course of things is about to take a different turn. Citizens no longer tolerate it. And I tell you, the battle of the elite against the people will be won by the people. Here, too, you will not be able to stop this, but rather accelerate it. We will win, the Dutch people will win and it will remember well who was on the right side of history. Common sense will prevail over politically correct arrogance. Because everywhere in the West, we are witnessing the same phenomenon. The voice of freedom cannot be imprisoned; it rings like a bell. Everywhere, ever more people are saying what they think. They do not want to lose their land, they do not want to lose their freedom. They demand politicians who take them seriously, who listen to them, who speak on their behalf. It is a genuine democratic revolt. The wind of change and renewal blows everywhere. Including here, in The Netherlands. I am standing here on behalf of millions of Dutch citizens. I do not speak just on behalf of myself. My voice is the voice of many. And, so, I ask you. 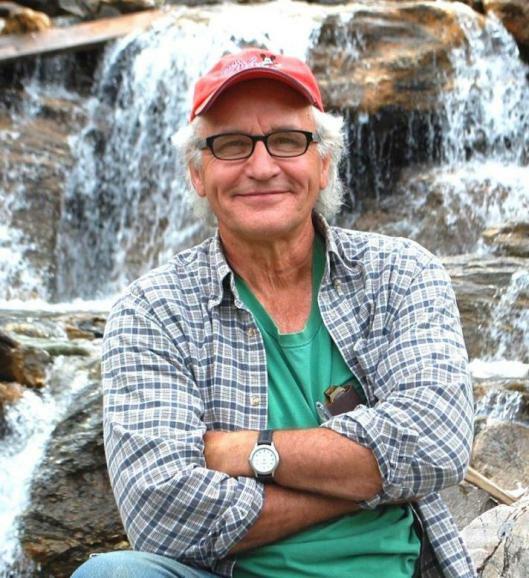 Paul Fromm is the Director of the Canada First Immigration Reform Committee. He points out that sentences are stronger for hate against minorities but not for hate against white people. This is bias against whites. This case was a judgement by Judge Harry van Harten. Brad was in a Catch 22 situation: damned if you do, damned if you don’t. He’d arrived home from work in Fort McMurray that afternoon and found a business card from the RCMP. He informed his advisors at CAFE, lest he be arrested, passed the word to several others and went out to dinner with a friend. Why, you might ask, did he not take the card and call the cop back? Well, he’s under a probation order from Ontario Judge Kelly Wright forbidding him from contacting or expressing his views to police, media or political groups. [Yes, that Orwellian order was imposed, not in communist North Korea or in some African despotism, but in an Ontario court that gurgles on about Trudeau’s Charter of [very limited] Rights and Freedoms. So, strictly speaking, Brad was not supposed to talk to the police. Were they trying to entrap him and send him back to jail. Fort McMurray sees regular killings among its newly acquired Somali community but the RCMP seem to spend an inordinate amount of time and manpower trailing, visiting and harassing the town’s most prominent dissident. It takes two cops in two cars to do all this? And am I actually being ‘investigated’ or intimidated? I asked them this. I also told them that I am under their own order as well as a Court order not to communicate with them and, as they had visited me three times to communicate with me, this constitutes a ‘conspiracy to impel an offender to breach bail/court orders’ and I would be subpoenaing them to my October 26 trial to let a judge hear of this. They were not happy campers upon hearing this. 1. Besides Kuwaiti money being poured into it, is any public money being thrown at the local super mosque that’s being built? 2. How much did our Western Summer Games cost/lose? 3. What is the true price of our real estate collapse in Alberta? 4. Who dares to take on or even discuss all of those ‘Natives only’ hiring practices? 5. There are so many Somali shootings here, yet no media attention. Why? 6. Who calls for the media’s constant stream of multicult promotion or do they make it all up themselves? 7. How many millions of dollars are sucked out of my country by Temporary Foreign Workers sending money home to the Philippines, Jamaica, Africa, etc.? 8. And what do banks like the TD, RBC or Western Union make by facilitating such a drain? 9. What does our over-staffed $1.25 a ride whoosh transit company lose yearly? 10. How many local jobs have been lost due to the $43-a-barrel oil? 11. What do so many sickly recent immigrants and their large broods, whom I never see working, cost my local hospital, schools and welfare system? 12. There are many sports and entertainment facilities being built here that no one asked for. What are their final costs to the taxpayers? And how many people will actually use them? Beware of your government using your money to amuse you. 13. Why is the Food Bank here always empty? One thing we should do to increase our physical safety is repeal our remaining laws against hate speech. Isn’t that claim outlandish? It might seem obvious that if we want to protect ourselves, we should instead police expression even more vigorously than we do now, so that violent people will be less likely to see or hear something that sets them off. Well, of course, we know that by giving in to the heckler’s veto, we simply create more hecklers, and more raucous hecklers, at that. So maybe stricter laws against expression isn’t the answer. But how could having no anti-hate laws help us? I don’t mean to argue here for repealing our laws against the expression of hate on the grounds that they are anti-democratic, or that they deform public discourse, or that they are contrary to the ideal of the moral autonomy of the individual, though I think each of those arguments is sound. I mean to explain how the laws we currently live under, mild though some think them (though Arthur Topham or David Ahenakew would disagree), encourage the offended to take up violence. Those who lash out physically against people who (they feel) have ridiculed or offended them are lashing out because they believe they have suffered an injustice. My argument is that laws against the expression of hate endanger us because they affirm and encourage that belief. That is to say, countries that have laws against hate speech proclaim through their laws that some targets of expression are, indeed, victims of injustice. As victims of injustice, they are entitled to restitution through the punishment of their assailants. The police and the courts don’t always get things right, of course. Someone has defamed you by attacking your religion, and so you complain to the officials, but the officials decide that the speech that offended you didn’t cross the line. But it did, you think; or the line wasn’t properly placed. You believe that you are a victim of injustice, an injustice, moreover, that the state refuses to rectify. How many times was Charlie Hebdo investigated for violating France’s laws against the expression of hate? At least twice, and both times acquitted. What’s left to do but attack it yourself? If, on the other hand, Canadians were truly to embrace freedom of expression, and get rid of our laws that censor or suppress expression, we would thereby say to the world that being mocked or ridiculed or subjected to expressions of hate is not to suffer an injustice. That you have been insulted, offended, or upset by something someone said does not make you a victim, and you are not entitled to restitution or compensation. Repealing our laws against the expression of hate would make us safer by removing from our culture official affirmation of the thought that a person’s hurt feelings merit official concern. Removing that thought would weaken the desire to take the law into one’s own hands when the state refuses to come to one’s aid. My argument is speculative in that it contains a premise about cause and effect for which I cannot cite adequate evidence. According to that premise, removing laws that imply that one who has been offended or demeaned can thereby be a victim of injustice will result in fewer people thinking they are victims of injustice. If that premise is true, then that the attack on Charlie Hebdo was committed in France by Frenchmen isn’t entirely a coincidence, for France has stronger laws against the expression of hate than most other European countries and enforces them regularly. But why think that that premise is true? Empirical evidence would be needed to settle the question. All I can say in defence of it right now is that, generally, legal culture affects the mores and attitudes of the individuals who make up a society. For reasons of safety, then (along with all the other reasons), let us not accommodate even in the slightest demands that people be silenced, no matter what they say or how hurt people are by what they say. That would take offence out of the realm of law and politics, and that would (probably, maybe) lessen the chance that the aggrieved will style themselves victims and their violence justice.